The Roman Coliseum is one of the most visited sites in Italy. People come from all over the world to see the famous place where gladiators fought in days of old. The history of the Roman Coliseum is quite fascinating, and still brings spectators to its ruins today. The construction of the great amphitheatre began somewhere between 70 and 80 AD by Emperor Vespasian of the Flavia family along with his son Titus. Because of this, it was originally known as the Flavian Amphitheatre. It had a seating capacity of 70,000 and was once the most important place in the entire Roman Empire. The opening celebration was so lavish that it lasted for 100 days. The coliseum was built on the site of Nero’s lake below his enormous palace. It was constantly in use until a fire, caused by a lightning strike, damaged it in 217 AD. The repairs were completed in 238 AD. Roman citizens could attend events for free, but seating was dependent on social status. The higher up on the social ladder you were, the closer to the front you were seated. Gladiators fought each other and wild animals, and games were organized for the pleasure of the Roman citizens. This gory form of entertainment was quite the popular thing to do by people of all classes. It was finally done away with by the leaders of Christianity. The games were also phased out because of the massive expenses inherent with these events. Eventually this massive structure stood largely empty. Many earthquakes damaged the amphitheatre and by 508 the structure was in poor condition. In the Middle Ages, it was turned into a fortress and later a church was even built into a corner of it. It later became a stone quarry that supplied the builders of St Peter’s, Piazza Venezia, and the Barberini Palace. 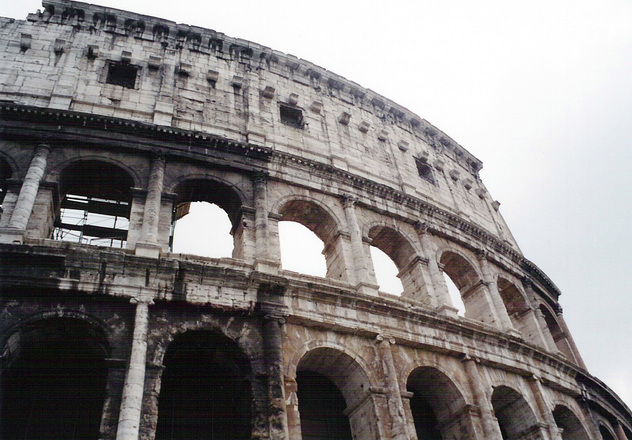 During the Middle Ages, the former pride of Rome gained the title of Coliseum. This name came from a colossus, or big statue, of Nero that was situated close by. Now the original name is not even known by the general public. As it stands now, the floor is gone, but some of the walls still stand. There are also the underground structures that you can tour along with the buildings that were added along the walls for vendors and such. You can see men clothed in the traditional garb of ancient Roman soldiers standing watch outside the Coliseum as you can tour the ruins for around 12-15 Euro. It is a priceless experience and anyone visiting Italy should go to see the ancient ruins of the great Roman Coliseum.